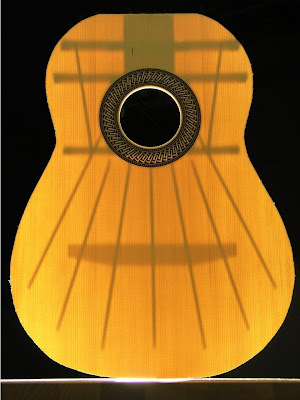 The transverse brace where brought to final dimension in the same manner as the fan and finger braces, width first and then the height; 6.5x14mm for the brace below the soundhole and 7x15 for the two above. At this point I also numbered each brace on the end from 1-3 to be able to easily distinguish the three. Once the planed to size, the lower transverse brace had to be arched to fit the dome of the lower bout. This was done using and scalpel and a 25' radius template I made. 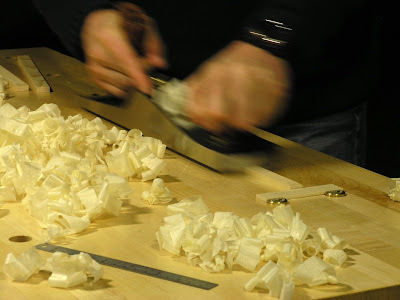 Then the arch was done with my block plane on the shooting board. 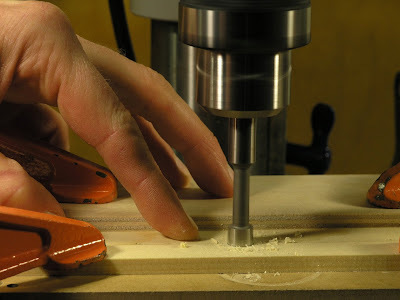 The apertures were cut using a drill press and a 3/8" forstner bit, set up to cut a semi circular hole with the bit extending halfway, about 5mm, into the brace. First I tried to do this without any support to the protruding part of the bit but the bit wandered a little and left as skewed hole. It also left a somewhat rough cut in the soft spruce. I changed the bit to a bradpoint to see if that would work better, but it did not. Though the cut seemed to be a smoother I had a hard time holding the brace in place. It simply bit into the brace and chewed it up to the extend I had to make myself a new one from scratch. In the end, I did the cut with the forstner bit and supports clamped to the drill press table on both sides of the brace, leaving a snug fit for the brace to slid back and forth in. 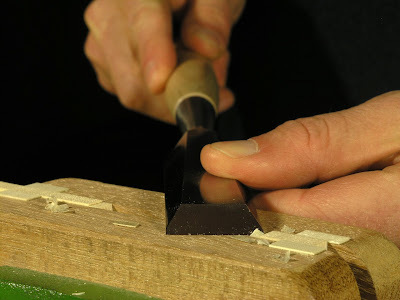 The waste in between the holes was pared away with a chisel - first with broad stroke and then gradually finer until a flat surface between the holes was achieved. 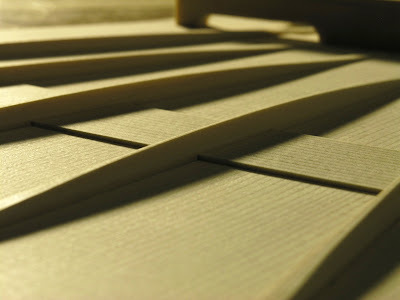 Each end of the apertures were given 3mm long notches, to accommodate for the overlap of the underlying grafts. 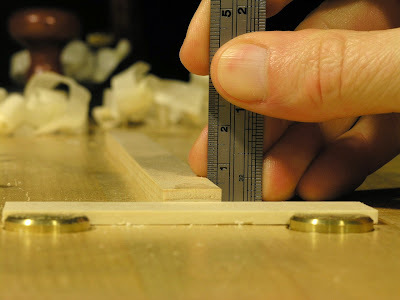 I used a small ruler as a fence to mark the initial cut by laying it on the braces flush against one side measuring 3mm beyond the aperture and butted the back of the chisel up against the ruler to score a mark, flipped the chisel over and made the 0.5mm deep cut. 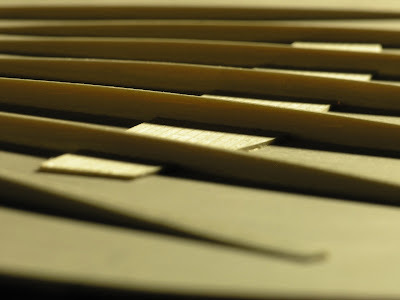 The waste was pared away in a similar fashion to the bridge graft notches of the fans. 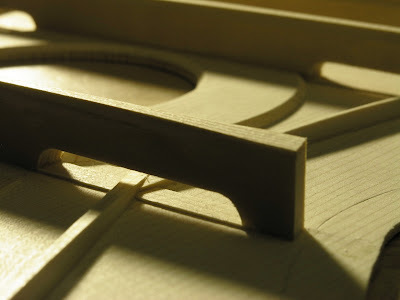 The aperture grafts were done a little on the long side to allow for inaccuracies in their initial gluing to the soundboard, cutting of the apertures and their notches. To make a nice fit I had to trim the ends. 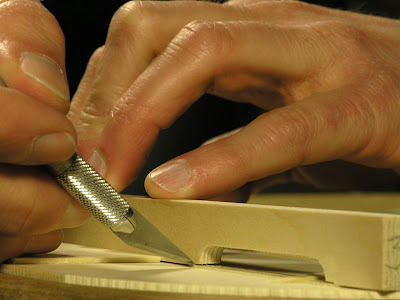 Each transverse brace were place on top of their corresponding graft and marked with a scalpel. 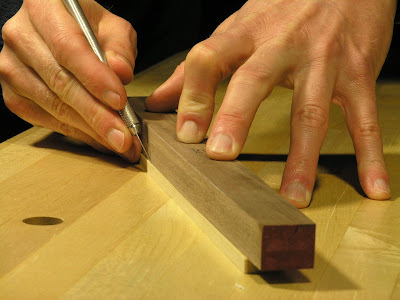 Then the ends were carefully cut with a 1/4" chisel. 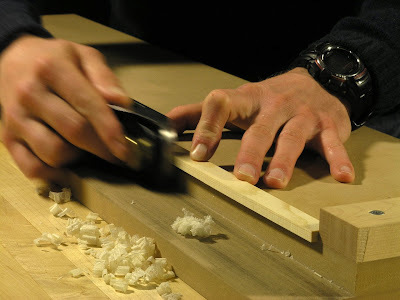 I say carefully because the first cut nearly penetrated the soundboard as the chisel went though the graft. 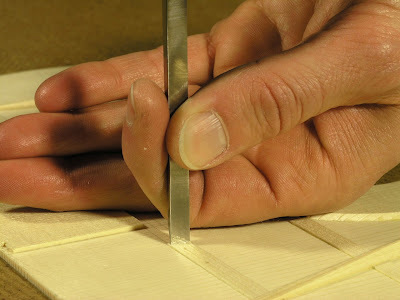 The consecutive cuts were done much more caution, less pressure and a little more wiggle and sliding back and forth of the edge. 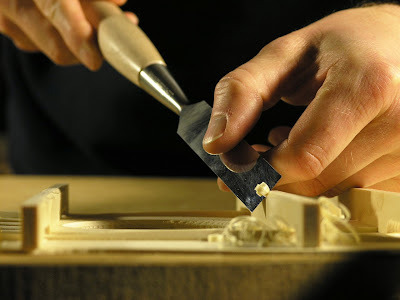 I used the polished back of the chisel to monitor that the cut was executed square to the graft. Last, the waste was pared away and the braces were ready for a dry fit. As with the other braces I had made caul for these out of 1/8" maple, each stuck on with doublesided sticky tape. 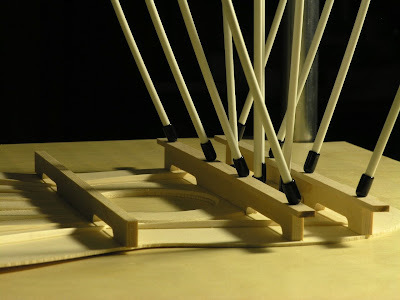 I glued the lower brace on first using the 25' radius dish and four go-bar rods. 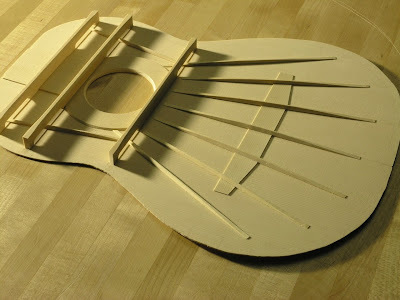 The braces was butted tightly up against the soundhole doughnut and held down with one rod. This work very well in preventing sliding as did the aperture grafts. 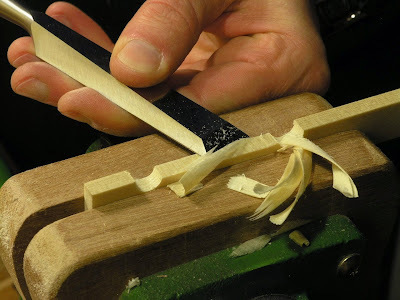 Once the first rod was in place I added a rod to each of the ends and last a rod was added to one end of the middle section and the first rod was repositioned to the other side of the middle section and after some glue cleaning with a chisel the whole setup was left to dry. 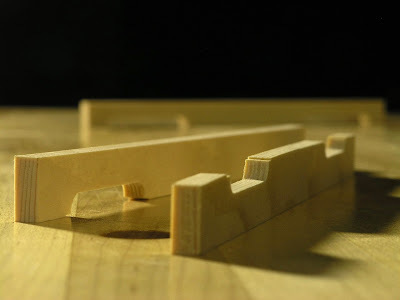 The two upper braces were glued on the same way, however, they were done flat without the dish and in conjunction with the lower fingerboard graft. 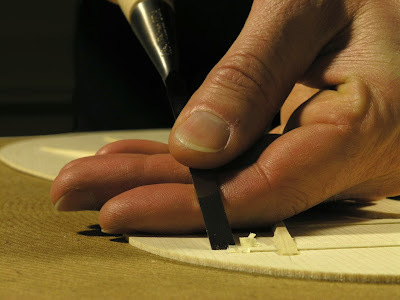 The fingerboard graft had been fitted to a nice and snug fit that held all three item in place between the soundhole doughnut and the upper fingerboard graft. 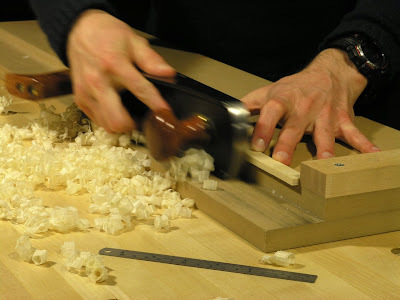 The peaking was done to with a 3/4' paring chisel in the same way I did the fans, though not to the same extend. 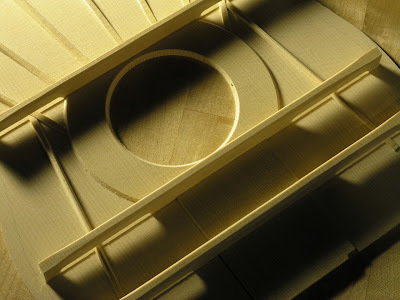 Studying photograph's of Jeffrey Elliott's soundboard I tried to emulate the look of his by carving only small bevels, 1/16" x 3/16", across the top starting and ending about 1/2" from the ends, roughly above the outer ends of the apertures. 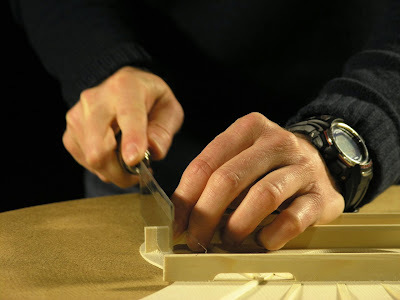 The end of the braces were trimmed to the template plus about 2mm (the thickness of the sides) with a small razor saw stopping short of the soundboard surface in order to minimize potential marring. 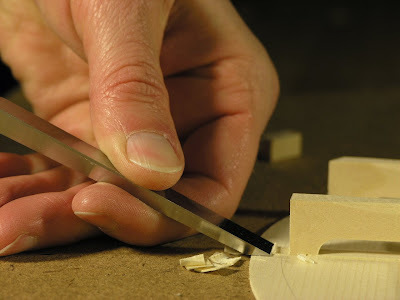 The last bit was pared away with 1/4" chisel. Well, I didn't really do much fine tuning. 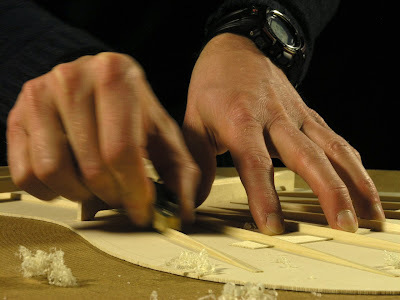 In Cumpiano's book he mentions that the final graduation of the braces is the ultimate test of the luthier's mastery and that the beginner should just strive to get a clean looking bracing job. I somewhat resigned myself to this. I had a huge urge to start carving away, a temptation I just had to resist as I felt the bracing is on the thin side dimensionally as it is. Also, the whole thing felt somewhat meaningless and arbitrary as I had nothing to compare with. However, I did try it out a little bit just to see what all the fuss was about, in particular by shaving the peaks down a little on the outer four fans, feathering the ends a little and going over irregularities on the whole. I was fun to listen to the soundboard drop in pitch as it loosened up, though not dramatically so in any way. 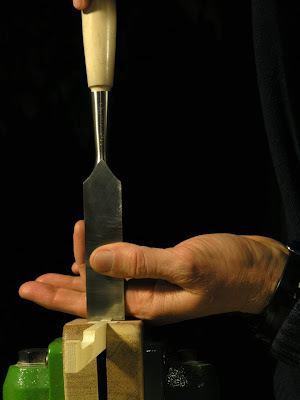 It was also quite revealing how big a difference it made to hold the top as well as tapping it in different places. Just by holding the soundboard one way as opposed to another, would change the sound from a dead "Thud" to a distinct "Dooong" and visa versa. I also noticed the bridge area would produce a more ringing sound whereas tapping the periphery seemed to give a more rumbling sound. I did wonder though, whether I wouldn't have better off doing this final voicing before the transverse braces were glued in place as they were in the way of paring down the fingerbraces and the upper part of the outer fans.